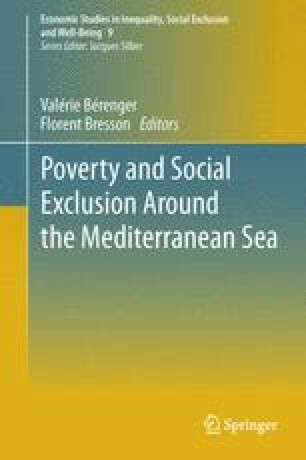 In this chapter, we investigate the geographical and sectoral profiles of poverty in Lebanon using data from the country’s 2004 National Survey of Households Living Conditions (NSHLC). With this objective in mind, we have adopted both unidimensional monetary approaches and multidimensional approaches to poverty. In the case of multidimensional approaches we focus on four dimensions of poverty: expenditure, education, housing conditions, and access to basic services. The poverty measures are estimated according to standard monetary FGT indices and their extension, based on Alkire and Foster’s method, in the multidimensional case. The robustness of rankings (by mohafaza and by occupational sector) resulting from these measures is then tested using stochastic dominance procedures. Our findings suggest that caution should be exercised when the conclusions drawn from typical poverty profiles depend on the researchers’ arbitrary decisions. Also, they shed light on the limitations of conducting an analysis that is solely based on the monetary dimension of poverty, as it may not necessarily corroborate the results provided by multidimensional analysis.